« Episode 156: Interview – How a local chocolate shop uses Facebook, Twitter, QR codes, and Groupon to drive business. Jim walks you through his latest computer purchase, and tells you everything you need to know before buying your next computer. Oh man, it’s like Christmas. I can’t contain my excitement. After weeks and weeks of deliberation and research, I just bought a new computer. And since I’m the guy that many people turn to for advice, I’m going to give you every piece of knowledge that I have. Why should you trust me? It’s in my blood. I’m a geek. 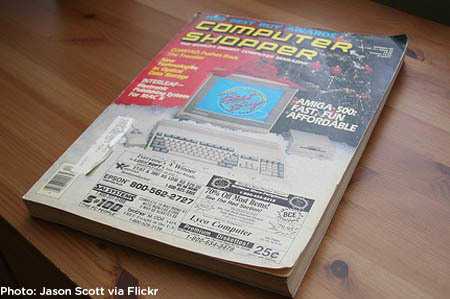 I used to buy and read something called The Computer Shopper. Do you know what that is? It’s a magazine that lived from 1979-2009 — with a peak in the 80s and 90s — that advertised computers. That’s it. To call it a magazine is an understatement. It regularly topped 800 pages! There were probably 5 articles. It was the size of a phone book and just page after page after page of ads. Glorious ads for the latest and greatest computer parts and peripherals. This article by Jason Scott tells more. So I urge you to listen to my advice – but then make sure you are making the right decision for you. Two reasons. In February 2009 I wrote a curious blog post about buying a netbook and was just as excited, although reading it again now, you can tell right from the title that I was caught up in the hype, not making an informed decision. Secondly, I decided to buy a desktop. A guy at work that I trust that talks computers with me bought a powerful desktop awhile fairly recently and says he rarely uses it and now regrets it. Apple says that more than 70% of their sales are laptops. Am I living too much in the past? We’ll get to that. Q1: Can I afford a new computer? A: What did you have for dinner last night? Ramen noodles or Filet Mignon? Interestingly, while the answer to that question might indicate whether you are a starving student or an accomplished CEO, there’s a lot more to consider. Long gone are the days when buying a computer was a luxuryâ€¦ something that was nice to have. Now anyone with an email address needs some kind of access. that doesn’t mean they need the latest and greatest. So check that bank balance as you contemplate whether you need a new computer, or just want one. Having worked with a financial planner since MY Ramen noodle days, I’m fortunate enough to have most of my ducks in a row. So if you’re maxing out your 401(k), have a little emergency fund, are not living paycheck to paycheck, and this purchase isn’t being added to a mountain of credit card debt, continue. Q2: Do I even NEED a computer? A: If the whole retirement fund reminder made you think twice, perhaps you don’t even need a computer. A close friend of mine is an artist, and it definitely shocked me when she told me she didn’t have a computer at home. Q3: Will an iPad work just as well? A: While work computer + smartphone can satisfy the computing needs for a decent percentage of people, adding an iPad to the mix broadens the circle even wider. I agree with the countless reviews that have called tablets the right choice for consuming content, not creating it – lean back vs lean forward. Everything my friend does on the iPhone — quick emails, maps, social media, viewing photos, and surfing the web – the iPad does bigger and better. Add in a better movie, news and gaming experience, and next thing you know you’ll be selling your TV, getting rid of cable, canceling your newspaper subscription, and pawning your Xbox. What’s more, specialized apps keep getting better and better. Even high octane programs like Garageband and presentation software like Keynote are translating well to the iPad, making creating content a viable option. Factor in the iPad’s $499 starting price and lightweight size, and the death of the desktop seems imminent for some. Q4: How important are computers in your life? A: OK, now we start to dig into your buying psyche. Know thyself. I’m a computer guy. 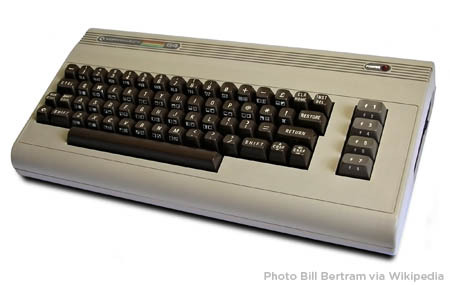 Have been since I got a Commodore 64 when I was 12, and when I chose Computer Information Systems as a major when I was 18. I’m also a car guy and a sports guy. That means I once snuck off and drove to a trucker bar on Route 95 in Maine to watch a Red Sox playoff game — Hey, it was rehearsal for my cousin’s wedding, not the wedding itself! And it means it’s worth it to me to invest in the right tech gear. If eating at amazing restaurants every night, always having the latest fashion, or filling up pages of your passport with exotic locations are your thing, then that’s where you should spend the extra money. Know thyself. – I own an iPad, iPhone, and 3 iPods – why not go all in? Thus, I would recommend to friends and family to get an Apple computer, and many of the tech specs will cover Apple. A: For a large majority, a laptop is the way to go. And why not? They are no longer the weaker-built little brothers of the desktop. By all means, if you are a student, travel often, are pressed for space, and don’t want the hassle of a large computer, go with a laptop. Apple can walk you through most of what I would add here, suggesting a Macbook for basic needs, a Macbook Pro if you are more of a power user, and a Macbook Air for those that fit that niche. 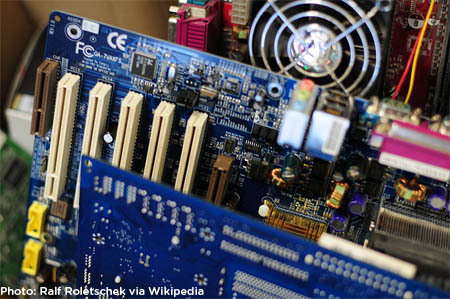 Q7: When is it time to upgrade your computer? A: Often it’s a simple choice. Your old computer dies. You’re going off to college. You’re traveling more and need a laptop. But many times it’s a combination of many things. Here is why I bought a 21.5′ iMac desktop. My MBP has a 120 gigabyte hard drive, and about six months ago I started running low on storage space. So I did the logical thing and started looking for big files to clear off. I backed up 100 podcast files, deleted a lot of junk, and it freed up some space. That lasted a month or two. Now you start digging a little deeper, and it hurts a little more. Should I delete those photos or will I want to see them again some time? I really don’t listen to those songs anymore, but I hate to delete them. Will I ever need to reference a bunch of those PowerPoint presentations, or can I trash them? Then things really are a pain. You don’t want to install the 200MB iTunes or OSX update. Your iPad is having trouble backing up. The low disk space is cropping up every few days. The problem I found was that I had lots and lots of files in lots of categories. In other words, I didn’t simply have 40 gigabytes of music I could remove. The disk space was spread evenly among photos, videos, podcasts, music, presentations, and other projects. Yes, I could have been disciplined and backed up things on to drives, but I didn’t WANT to. I wanted all my stuff on my computer. Yes, I could have paid someone a few hundred dollars to buy and install a larger drive, but I didn’t want to. Once again, this wasn’t an all or nothing item. Does my computer run ok? Sure. But it feels a lot slower. Photoshop is dragging. Videos on the web are struggling. It’s not as â€˜snappy’ as it used to be. The computer is feeling four years old. The fact is, the things I plan on doing more of require more horsepower. If you are writing a novel in Word or simply playing Farmville on Facebook, go with the basics. – I do a weekly podcast, creating and editing large files every single week in GarageBand. – While I DID take time to write a book, it was much more than MS Word. I am hands-on and the book has an associated Facebook page, Twitter page, website, email list, newsletter, speaker page, press kit, publicity, and hopefully, an iPad app. All of these things require tools manage. – Lastly – and cool for people that listen to The Hopkinson Report podcast – is that I want to do more video. This will be both for the podcast and for the book, but I want to give a shot at using my HD quality DSLR, getting some basic lighting and sound, and learning Final Cut Pro. More than anything, that requires some horsepower and screen size. Q8: What tech specs on the iMac are worth upgrading? 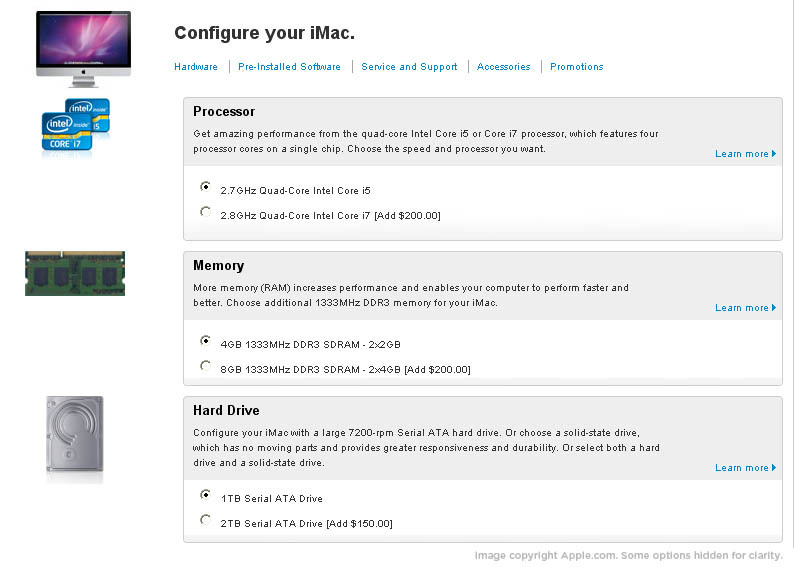 – Should I get the 21.5′ or 27′ iMac? – Should I get the 2.5GHz Quad-Core Intel Core i5 or the 2.7GHz i5 chip? – I’m sure that for 99% of users, they cannot tell the difference between the two i5 chips. Splitting hairs. The $300 increase on the Apple page is more about the larger hard drive (increasing from 500GB to 1 TB) and better graphics card (model 6750 vs 6770). For this choice, it was easy. – Should I spend $200 to get the 2.8GHz Quad-Core Intel Core i7 chip? – This one was a tougher. I knew deep down that the increase in speed from the i5 to the i7 would be minimal. Maybe 5-15% at best. And it wasn’t like I was going to pick up Final Cut in a weekend and be editing The Hangover 3 by the end of the year. Plus, even the lowest chip option would be significantly faster than what I was currently using. However, as stated earlier, I’m a computer guy. It’s worth it to me to get the best. This computer is going to last me 4 years, and if I use it nearly every single day, and I do start to do more editing, I’ll be glad I spent a little extra on the chip. – Should I spend $200 to upgrade from 4GB of ram to 8GB of ram? – While differences in chip speed may be slight, 20 years of experience have taught me that more ram is always, always better. I’m looking at you, Photoshop. – Should I spend $150 to upgrade from the 1TB hard drive to 2TB? – Yes, video, photos, and music take up a lot of room. But I survived 4 years – and 157 podcasts – with only 120GB of disk space. I had already effectively upgraded from 500GB to 1TB in an earlier step, so I’m hoping 10x my current storage level will suffice. – Should I get the Apple magic mouse or magic trackpad? – Thought about the trackpad for a second, but doing podcast editing and photoshop, I need a mouse. In fact, I might even keep my trusty Logitech wireless mouse. We’ll see. – Should I get the Apple wireless keyboard or the wired keyboard with numeric keypad? – For a beat, the accountant in me kicked in and I thought about that keypad. But the wireless will be fine for me, and offers another huge advantage (see below). I did not get any other software or accessories. Q9: What time of year should I buy my computer? 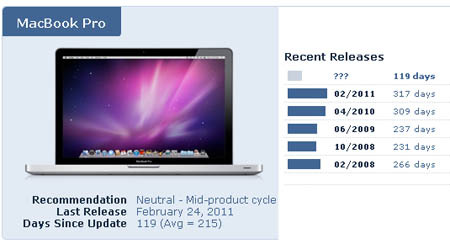 A: An invaluable resource for all Apple products is the Macrumors.com Buying Guide. They track the product development cycle so that you know with a pretty good deal of certainty when the best time to buy that device is. That’s why I waited to buy my iMac (updated in the last 6 weeks) and why I didn’t get the iPhone 4 yet (hoping for August). Should I wait until July 2011 to buy my computer so that OSX Lion is already pre-loaded on the computer? I decided not to, for three reasons. First, it is risky to have the first release of any kind of software, so if I have the older operating system on there, I can wait a few weeks to make sure there aren’t major bugs. Second, the Apple rep confirmed that the upgrade from Snow Leopard to Lion wouldn’t sacrifice disk space and functionality. I’m taking them at their word, but I was able to seamlessly update from Leopard to Snow Leopard. I shudder at taking a Windows PC from Windows XP to Vista, and all the drivers and files that would be left behind in the process. Third, I made sure that I was in the window where I would get the upgrade to the new OS for free, thus saving $30. Q10: Are there any discounts when buying an Apple computer? A: Yes. Check with your company to see if there is a corporate discount. Conde Nast offers one, and it turns out that it is 6%. Not amazing, but it adds up on a high price item like a computer. However, since I also teach and have taken classes at NYU, I was able to get their education discount. The sales rep ran the numbers and it turned out to be a discount of 6.7%, so I went with that. The other thing that worked out was that Apple announced their annual back to school program the day before I ordered. While some are disappointed at the offer (previous years have given away free iPods), I am fine with the $100 gift card to the App store, which I will use on Final Cut Pro X (see below). I am also lucky enough to have a friend that works at Microsoft, who is able to get me (purchasing it legitimately as an employee) MS Office for the Mac at a price less than what Apple charges. 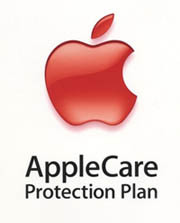 Q11: Is Apple Care worth the money? – What is your risk tolerance? Are you willing to spend a few hundred dollars to have peace of mind for 3 years and go to sleep every night knowing that if something breaks, they will fix it free? Or do you roll the dice and hope you don’t have a problem? Here’s my thought process. A laptop takes a lot of abuse. It gets open and closed, jostled in bags, run through security, has a lot of little parts, is exposed to the elements while traveling, and has the occasional Tall Vanilla Soy Latte spilled on it in a Starbucks. I got really lucky with my Macbook Pro. The video or logic board or something got fried out of warranty – what would have been a costly fix – but when they looked it up it was a known defect from the month and year that I purchased it (June 2007) and evidently Apple got the part manufacturer to agree to replace them whenever a user had a problem. So I got it done for free. 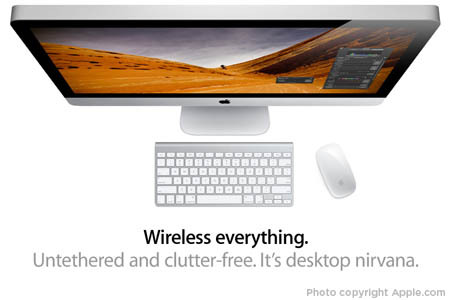 But the desktop that I am buying pretty much sits in the same place on your desk all the time. And I’m also of the feeling that if something is going to go wrong, it’s going to do so in the first year of use. So I hedged. For now. Apple allows you to wait until the very end of your included one-year warranty before deciding if you want to purchase Apple Care, so I am going to see how things go for the next 11 months and make the decision then, but I’m thinking of rolling the dice. Q12: What changes in 2011 and beyond are going to effect my computer purchase decision? A: It’s trueâ€¦ this might be the last desktop computer I ever buy, and it may be the wrong decision. But this is my favorite partâ€¦ predicting the future and listing what I am excited about. I already use Google docs and Dropbox pretty extensively, and cloud computing is going to continue to grow. We will still need an input device for managing these files, and for me right now I think the best tool will be the desktop. Apple has tried it’s hand at cloud computing in the past, so there is hesitation to think that their new iCloud service will get it right. We’ll have to wait and see. My timing and desire to get into editing video is an interesting one. 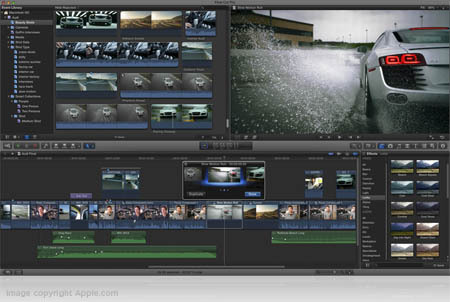 At exactly the time that I began asking myselfâ€¦ how can I possibly think about spending $1000 on Final Cut Studio, I read about and witnessed the release of Final Cut Pro X in the Mac App store. It’s not even available on disc. What’s more, the price for me will be $200 when I apply that education discount. Video is going to continue to blow up in the next few years, and I’m ready to see what I can do. To be clear, I am still hanging on to my laptop as a backup for now. As I analyzed my life, I realized that there were two scenarios where I might still need it – teaching my class and giving presentations. Both require portability (rules out the desktop), the ability to play large Powerpoints with embedded video, connecting to large displays, and demo’ing my podcast (might be a challenge for the iPad). But that’s about it. Desktop – In the end, I’ve chosen a computer setup that fits my lifestyle. Right now I spend an hour or two most days on the computer at home at my desk, working on side projects or staying in touch with family. A desktop will be the best use for this purpose (I’m not a â€˜blog in a coffee shop’ or â€˜work from my bed’ kind of guy). Smartphone – My iPhone (of course this could be a great Android smartphone) is my constant companion, and picks up the slack wherever I am. Tablet – The iPad or (this could be any tablet) has settled into a great little niche for me. It’s great for getting really quick information, like an actor in the movie you’re watching or getting directions after you’ve shut down your computer. It’s also amazing for travel. It’s perfect for a plane, and to keep me connected until I get to a business location (where I can use a computer) or to family members (when I can use their computer). I’m also excited to see if I can push it to the next level, in three ways. Bluetooth keyboard – I plan on using the wireless Bluetooth keyboard that comes with my iMac for data entry on the iPad. Yes, I know it will still not be perfect. But when I am in Buenos Aires next year writing the next great American novel, just a keyboard and a screen will be all I need. Presentations – At some point I will upgrade to the iPad 2 (or maybe wait for the iPad 3), so that I can test the video-out functionality with my presentations. I also will see how the Hopkinson Report Podcast template in GarageBand translates to the iPad version. After seeing one presenter try to ‘swipe’ his way through presentation slides with a few hiccups, I’m going to say it’s not quite there yet. Log Me In – The tech friend at work I was telling you about? He told me about Log Me In, a top-rated app that lets you access all your devices – home computer, work computer, parents computer – from your iPad. It’s something on my list to check out, as the ability to instantly tap into my powerful home computer will make me miss my laptop a little bit less. Summary: What is the most important thing to keep in mind when buying a new computer? A: The most important thing to keep in mind is to know your individual habits. Don’t let someone convince you to get the latest and greatest device if you don’t need it or can’t afford it. Also remember that you are constantly fighting the path of obsolescence. Will I be ticked when a newer Mac with a newer processor comes out very soon? A little bit. But I’ll feel better knowing that I bought the best computer I could at the time. This entry was posted on Friday, June 24th, 2011 at 1:23 am and is filed under Apple, Marketing Case Studies. You can follow any responses to this entry through the RSS 2.0 feed. Both comments and pings are currently closed.